KADHAFI MUDAHERANWA! Simple journal entry of impairment loss will be following. Every loss will be debited, so, we have debited impairment loss. With this, our asset will decrease. So, we have credited asset account. 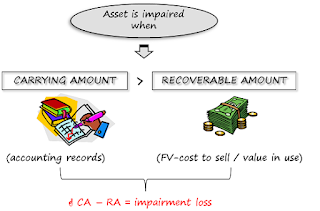 Because your debtor account will be 3456000 but not getting interest, we should send it to bad debts account instead of impairment loss because reason of decreasing our asset value due to the default of debtor not due to changing of market value. We can just pass following journal entry. In income statement, this loss will be debited. In balance sheet, this loss is deducted from sundry debtors for loan. No Comment to " Journal Entries of Impairment Loss "